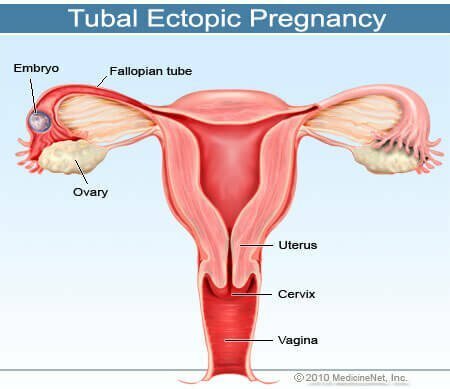 Ectopic pregnancy: A pregnancy that is not in the uterus. The fertilized egg settles and grows in any location other than the inner lining of the uterus. The large majority (95%) of ectopic pregnancies occur in the Fallopian tube. However, they can occur in other locations, such as the ovary, cervix, and abdominal cavity. An ectopic pregnancy occurs in about 1 in 60 pregnancies. Most ectopic pregnancies occur in women 35 to 44 years of age. The term "ectopic" comes from the Greek "ektopis" meaning "displacement" ("ek", out of + "topos", place = out of place). The first person to use "ectopic" in a medical context was the English obstetrician Robert Barnes (1817-1907) who applied it to an extrauterine pregnancy: an ectopic pregnancy. Pain is usually the first symptom of an ectopic pregnancy. The pain is usually sharp and stabbing. It is often on one side and may be in the pelvis, abdomen or even in the shoulder or neck (due to blood from a ruptured ectopic pregnancy building up under the diaphragm and the pain being "referred" up to the shoulder or neck). Weakness, dizziness or lightheadedness, and a sense of passing out upon standing can represent serious internal bleeding, requiring immediate medical attention.